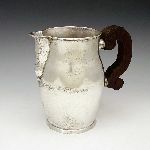 1 WILLIAM SPRATLING MEXICAN SILVER PITCHER: Ca. 1940-1946. With makers mark and Spratling Silver, Rosewood handle, hand hammered. 22.9 troy oz., 6 3/4''h., 7 1/2'' wide overall. 2 WILLIAM SPRATLING MEXICAN SILVER BOWL: CA. 1940-1946. Hammered silver bowl with incised vertical lines and trio of looped handles with beads. 9.67 troy oz., 2 1/4''h. x 6''dia. Makers mark and Spratling Silver on underside. 6 SOUTH AMERICAN SAINT WITH BABY JESUS. Oil/Canvas, 16 1/2'' x 13'', carved and gilded frame, 19 1/2'' x 16''. From the collection of former US Diplomat and State Department official John E. Karkashian. 6A SOUTH AMERICAN JESUS CHRIST: Oil/Canvas, 16'' x 10 1/2'', carved and gilded frame, 19 1/2'' x 13 1/2''. From the collection of former US Diplomat and State Department official John E. Karkashian. 7 SOUTH AMERICAN SAINT WITH CROWN OF THORNS. Oil/Leather, 9'' x 7'', framed, 17'' x 14''. From the collection of former US Diplomat and State Department official John E. Karkashian. 7A SOUTH AMERICAN SAINT JOHN: Oil/Canvas, 12'' x 8 1/2'', carved and gilded frame, 17'' x 14''. From the collection of former US Diplomat and State Department official John E. Karkashian. 12 CARVED GOTHIC STYLE TRESTLE BASE LIBRARY TABLE : Maple and walnut 2 board top with heavy carved apron. Scroll carved ends with gothic arched trestle and turned column supports. 57'' long, 29'' wide, 31'' tall. 18 EXCEPTIONAL PASTEL PORTRAIT CIRCLE OF PERRONEAU: 22'' x 17 1/2'', on stretched vellum, no visible signature, unframed, stretcher appears to be 19th c. or earlier. 20 THEODORE ALEXANDER ROBERT JUPE MECHANICAL DINING TABLE WITH 8 LEAVES: From the Vannuci Collection, an Art Deco Macassar Ebony Veneer and stainless steel circular extending Dining Table by Theodore Alexander. The circular top turning on a solid stainless steel Jupe mechanism to reveal eight openings for the insertion of leaf extensions, locking together to form a larger dining table above a plain frieze supported on angled and tapering supports issuing from an inverted conical base terminating in a stainless steel band. The table is accompanied by an appropriate baize lined leaf cabinet and 6 Theodore Alexander Vannuci Collection pony skin chairs. If you turn the tabletop 90 degrees anti-clockwise the crescent-shaped bars move the slices outward. Between each wedge is a gap shaped like a collar stiffener, with a point at one end. Into each of these spaces you slide a leaf made of the same wood as the original table top. To reduce the table, simply remove the eight leaves, twist the table top 90 degrees in a clockwise direction and the eight distant slices of pie slide together to make a circle again. Theodore Alexander in London makes fine reproductions of the Jupe Table such as this that start at around N6,600 ($13,200). Chairs original cost at $635.00 each. Sold as a set, Table and chairs together. 23 CIPRIANI, Nazzareno, (Italian, 1843-1923): The Serenade, Watercolor, 21 5/8'' x 14 5/8'', signed, N. Cipriani, Roma, framed, 27'' x 20''. 25 INTERESTING EARLY FRENCH? PORTRAIT: Oil/Paper/Board, 16'' x 11 3/4'', illegibly signed, newer frame under glass, 22'' x 17 3/4''. 29 SCOTTISH SCHOOL 19TH C. O/TIN BOY WITH DOG: 9 1/4'' X 7 1/4'', Possibly a King Charles Spaniel, period relief carved frame with wear, 14 1/4'' x 12 1/4''. 31 PAIR OF BOULLE INLAY SIDE CHAIRS: Delicate ballroom style with open back. Burgundy colored fabric seat, Legs trimmed in gilded ormolu. 17 1/2'' wide, 18'' deep, 37 1/2'' tall. 32 JIMENEZ Y ARANDA, Luis, (Spanish, 1845-1928): The Radish Pickers, OIL/Canvas, 24'' x 28 1/2'', signed Louis Jimenez, Pontoise, period heavy gilded and carved gesso frame with wear and missing gesso, 35'' x 40''. 37 COLLECTION OF 4 POND BOATS: Circa early to mid 20th century, largest measures 40'' h. x 29 1/2'' x 4 3/4''. All come with wood stands. 47 LASKY, L, (European, 20th C.): Couple in Horse & Carriage, OIL/Canvas, 21 3/4'' x 27'', signed, gilded and carved frame, 26 1/2'' x 32'', label verso Roosevelt Field Art Center. 50 ANDERSEN, Johannes Meyer, (Danish, 1915-2005): Snowy Trail with Horse Drawn Woodcart, OIL/Canvas, 27 1/2'' x 39 1/2'',signed, gilded frame, 35 1/2'' x 48''.